My name is Brent Ramage. I have been married to my lovely wife, Cindy, for 38 years. We have three sons, who are all married, and we have two grandchildren. We also have four fur babies, 3 dogs and 1 cat. Our family has been farming here since 1955. 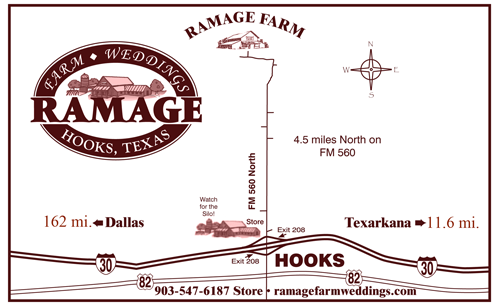 In 2004, our evolving mule barn, built in 1930, underwent another renovation and was converted into a wedding venue. One of my favorite things about operating the wedding venue is having a young bride tell me that she remembers coming out to the farm with her elementary class when we were raising pumpkins. I have met many of those “pumpkin kids” over the years, and that makes me smile. Hey y’all! I’m Erica Ramage, Brent’s daughter-in-law. My husband and I have been married for 11 years, and we have two fur babies, our yellow lab, Dolly, and a black cat named Miss Kitty. I assist Brent with giving tours of the venue and running our social media accounts. I also offer additional wedding coordination and styling services through my company, Bella Roo Events. My goal is to make wedding planning as FUN and stress-free as possible! I’m professionally trained by the Association of Certified Professional Wedding Consultants. I would love to help make your day one to cherish for a lifetime.